Incense is called ‘holy smoke’. Burning incense can clean the air and get a nice atmosphere at your house. Many people use incense when performing yoga or meditation. In earlier times it was made by monks and nuns. You can burn incense in different ways. One way to burn it is to burn it on charcoal. You light the charcoal and wait untill the sparkle goes all the way through and the coal turns white. It will take a little time, so please be patient! Then you put a few grains on top. The nice smell comes out immediately. A charchoal burns for about two hours and now and again you can add some grains or put on a different incense. A different, more easy, way to burn incense (and with less smoke) is to burn it over a flame. You need an oilburner for this. Put a small piece of foil on the top (it will protect your burner from getting sticky.) Light the flame of the candle. When the incense is exactly the right temperature, then you will get the nice smell, and you will be able to press the grains a bit (flexible). When nothing really happened and the incense stays hard, then the flame might be too far from the incense (doesn’t get hot enough). 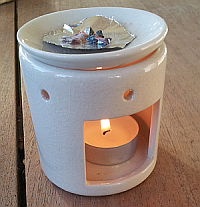 Then you can add one empty candle upside down under the candle, so to get the flame a bit higher, closer to the cup. You can also buy special sieve – burners. But an oil burner works just as well. Burning our incense acquires a bit more effort than burning incense sticks, but you can easily switch smells and one little jar lasts for weeks, maybe months, because you need only a few grains at a time.